Train2Game have launched an exciting new website where we get to show off the great accomplishments of our students. Train2Game Winners is a place where students who have achieved great things in the games industry will be celebrated. We thought it was high time to show the world just how successful our students can be. The website features testimonials from students in their own words about how they feel about Train2Game and the support they have received. We are proud of each and every one of our students and hope that we will be adding to this site with more new achievements from students in the near future. Visit www.train2gamewinners.co.uk to view the new site. Games queen Samantha Whale was handed her ‘key’ to the future at Bedfordshire University last Wednesday. The 17 year old student, from Luton, has won thousands of pounds over the last few months by taking on hundreds of opponents across the world in internet tournaments. And yesterday she was one of the media students at the leading university to enrol on a ground-breaking course which could lead her to a £50,000 a year job in the burgeoning games industry. The course is linked to a unique jobs search engine which allows students to get their CVs to potential employers while they are still learning. Bedfordshire University was so impressed by courses created by Train2Game, that last Wednesday it linked up to give students the chance of a career in the £300bn computer games business. And the university’s decision has gone a long way to boost the image of a world-wide training industry which has often faced a hostile press. The courses were written by computer game studio professionals and have the backing of TIGA, the games industry’s trade association. Bedfordshire University’s head of computer science Prof Carsten Maple said: “This is a great accolade for a company, to have their material taken up as part of our Bachelor of Science course reflects their strengths and knowledge. “We evaluated the materials produced by Train2Game and felt they made an important contribution to the curriculum of our BSc Computer Games Development course. Because the Train2Game materials are written by games industry professionals, with the involvement of the industry trade association, it will help to ensure our students learn relevant skills and are exposed to industry tools”. University adopts Train 2 Game’s ‘industry focused’ training program. 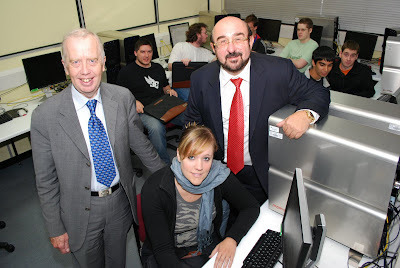 Luton, United Kingdom, October 21, 2009 --- Students in Bedfordshire University’s Computing Department received a welcome visit from Luton’s philanthropist businessman, Jan Telensky and his colleagues from ‘Train 2 Game’ on 14th October, when they delivered modules for Games Developer and Games Designer courses – the first designed for the industry by the industry. These ‘world first’ courses have the backing of TIGA, the UK’s trade association for games developers and are being integrated into the University’s BSc Computer Games Development course curriculum. The visit, heralds the first time that the training materials have been adopted by a University and comes just 7 months after the company first launched its Computer Games Designer and Computer Games Developer courses. To date over 6,000 individuals have wanted to sign up and around 20 students at Bedfordshire University will be studying the BSc version in this year’s intake. “We evaluated the materials produced by Train2Game and felt they made an important contribution to the curriculum of the BSc Computer Games Development course. We decided to integrate them into the course material for the 2009 academic year. “Because the Train2Game materials are written by games industry professionals, with the backing and involvement of the industry and its trade association, we feel it will help to ensure that our students learn industry relevant skills and that they are exposed to industry relevant tools”. The course was written by D.R. Studios of Milton Keynes, whose COO, Tony Bickley with over 25 years’ experience in the industry with the likes of Interplay, US Gold and Konami, was present during the hand-over to talk to students about the relevance of their studies to today’s computer games industry. Train2Game, commissioned industry games specialist DR Studios to devise and write the courses, for aspirants who are unable to attend University, and to provide an alternative route into this dynamic industry. Over the past month I am gob-smacked at the amount I have learnt. Although I have only started the course and done my first modules, I feel like this is what I should of been doing all my life. Every morning I'll wake up with answers to problems I had the night before in game designing, even when trying to sleep my mind is buzzing with new ideas. I have made great social network on the forum and have even started helping people out with their projects. I hope they lead to more projects as I thoroughly enjoy working with the people. Over all this has been a great opportunity where I have learnt SO much knowledge and can’t wait for more materials... BRING IT ON! I have never worked hard so as being doing this course I think that it is my first time I’ve ever worked hard at something like this. It’s part of my life plan to become a game designer.